After weeks of torrential rain, gray skies and miles of mud, there is still one place in North Georgia filled with sunshine-yellow vistas in every direction: Gibbs Gardens. 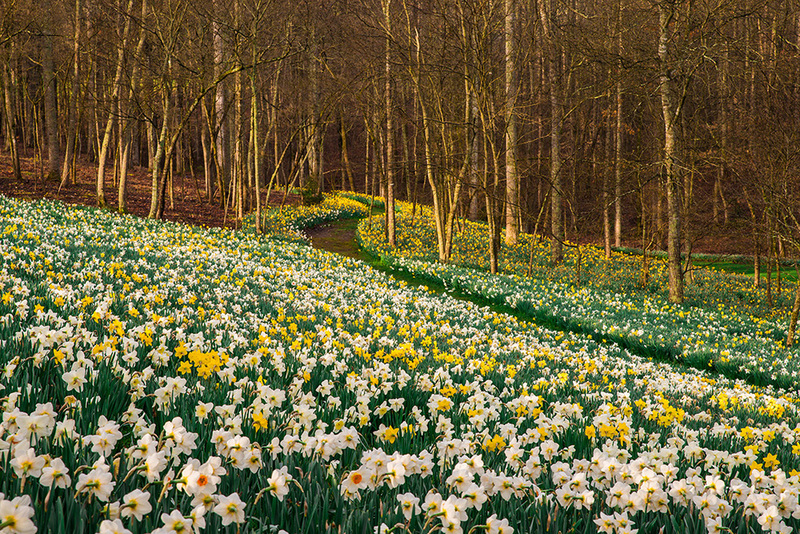 Its 50+ acres of Daffodil Gardens will carpet hillsides and valley with more than 20 million vibrant yellow daffodil blooms through mid-April. 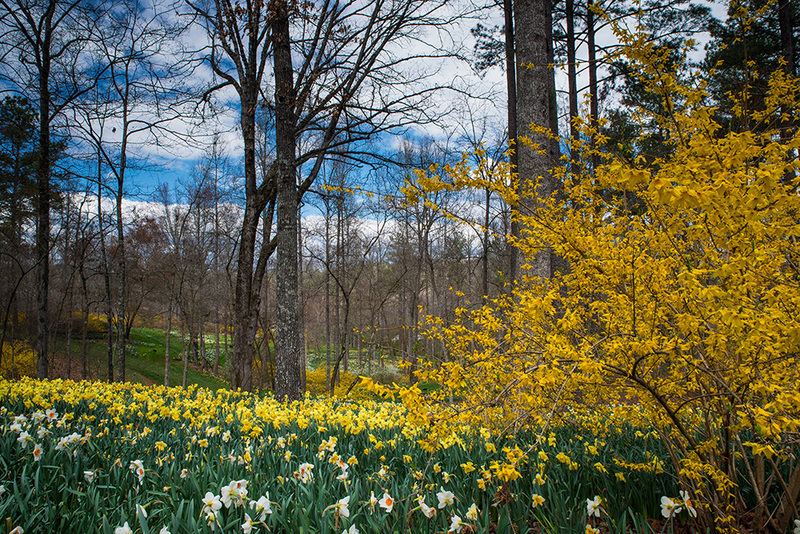 Jim Gibbs, owner, designer and developer of Gibbs Gardens, began planting daffodils in his gardens in 1987. "Over the years we've planted millions of bulbs representing more than 150 varieties—often planting more than 250,000 bulbs a year." To prepare for the 2019 season, an additional 60,000 daffodil bulbs were planted last fall along with more than 50,000 tulip bulbs to add splashes of vivid spring color to the gardens. "It looks like this will be one of our best years for lush daffodil displays," said Gibbs. "Everywhere I look the early blooming daffodils have more flowers and there are many more buds than we usually see on the mid- and late-season daffodils as they begin to burst into bloom." The Daffodil Gardens are the centerpiece for hundreds of cherry trees, forsythia, spirea, quince and thousands of mature dogwoods blossoming during the six-week daffodil season. Gibbs Gardens is one of only 25 designated American Daffodil Society Display Gardens in the United States. For years Gibbs contemplated adding a late spring garden to the 16 well-established gardens he has spent 30 years developing. "Irma forced me to move faster," he said, recalling Hurricane Irma's sweep through Georgia—with 40 mile-per-hour winds and 60-mile wind gusts—in September 2017. The storm ripped out hundreds of mature trees on a wooded hillside rising up from Gibbs' Japanese Gardens toward the Manor House Gardens. Looking across those acres of devastated woodlands the next morning, Gibbs recalls imagining a different kind of garden on that land. "I decided to turn that bare hillside into a new spring garden featuring collections of outstanding plants that would work well for home gardens," he said. He hopes his new project will inspire people who are planning a new garden or want to update/revitalize an existing garden. "We have many places in Gibbs Gardens that invite visitors to relax, meditate and just absorb the beauty of nature. This new garden is more a place to learn, observe and help gardeners see the very best of what's available and understand how to create a beautiful garden with these plants in their own yards." Gibbs plans to provide visitors with educational information about plants they may chose for home gardens and answer these common questions: Where do they grow? What environment works best? Will these plants work in their gardens? Gibbs expects his new garden to be ready for Gibbs Gardens' 2020 season opening but there's a lot to be done to meet his own deadline. In the meantime, visitors to Gibbs Gardens will have the unique opportunity to see how a major garden is created. Over the months they will be able to watch the garden's progress and discover what it takes to bring together all the elements—from walkways and irrigation to design and color—to build a 15-acre garden. During the 2018 season Gibbs planned and executed all the infrastructure needed for the new garden: designing the gardens' layout, removing downed trees and creating skylights for sunshine, adding irrigation, altering the hillsides to create level areas then adding walkways. Visitors to Gibbs Gardens in 2019 will see the garden transform, as the best examples of plantings from all over the country are trucked into Gibbs Gardens, unloaded then staged in preparation for planting. The new garden is designed with home gardeners in mind to help and inspire them as they plan for planting in their own yard. To show gardeners the full range of available plants, Gibbs is bringing entire collections of multiple plants to the new yet-to-be-named garden. "To feature these collections, we carefully selected mature plants from the best growers and set out to create a natural 'show room' or gallery for the public," said Gibbs. The collections will include azaleas, conifers, viburnum, Japanese maples, dogwoods, dwarf roses and the Southern Living plant collection. Azaleas featured will include natives, Kurume, Indica, Glenn Dale, Encore, and Satsuki. The garden will feature nearly a hundred native azalea varieties planted in groupings to create color wheels and S curves. There will be dwarf and intermediate conifers—more than 300 different conifer varieties—personally selected from Oregon conifer growers for the new garden by noted dendrologist Tom Cox of Cox Arboretum and Gardens in Canton. "We will be planting all forms, shapes and colors of these beautiful, lush conifers—it's like you just want to go over and pet them," Gibbs added with a smile. "This will be one of the most exciting gardens in the U.S."
"Our new gardens—with a huge range of varieties and groupings—will give home gardeners the opportunity to see how a plant looks in our garden along with other plants that complement it," he said. "We want our gardening visitors to be able to walk through this garden and imagine how these plants will look in their yards, to see how the plants grow and the best conditions to encourage healthy growth." 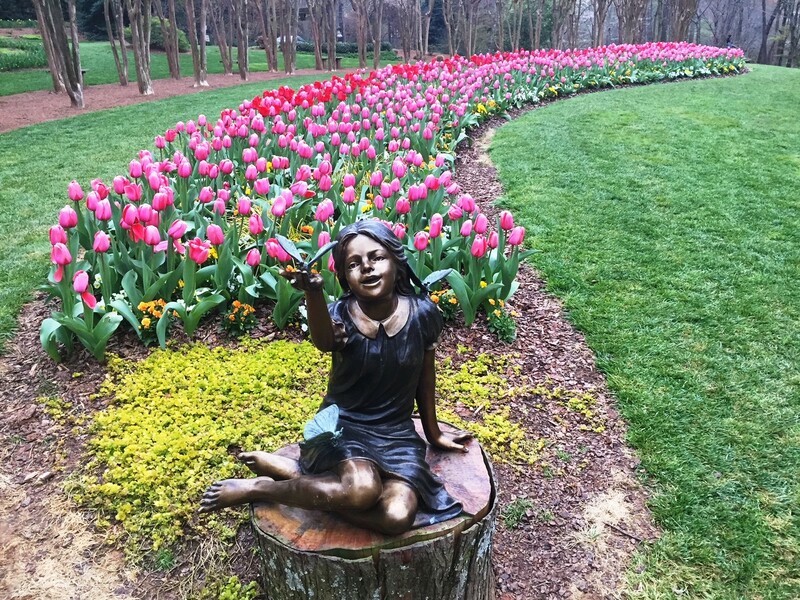 For more information about Gibbs Gardens including hours and directions to its Cherokee County location, go to www.gibbsgardens.com.